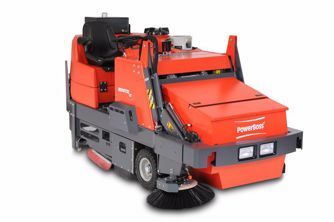 The PowerBoss Commander T82 is your all in one sweeper/scrubber. Have the ability to pre-sweep and intensely scrub at the same time controlled manually by the seated operator. Having the ability for a 54” sweep path and a 42” scrub path, it allows you to clean up to 67,000 square feet per hour. Weight with batteries: 2900 lbs.